HALIFAX — Canada's largest icebreaker is preparing for a critical expedition to the North Pole, marking the country's final mission in the High Arctic before making an official claim to the barren, but strategically important area at the top of the world. 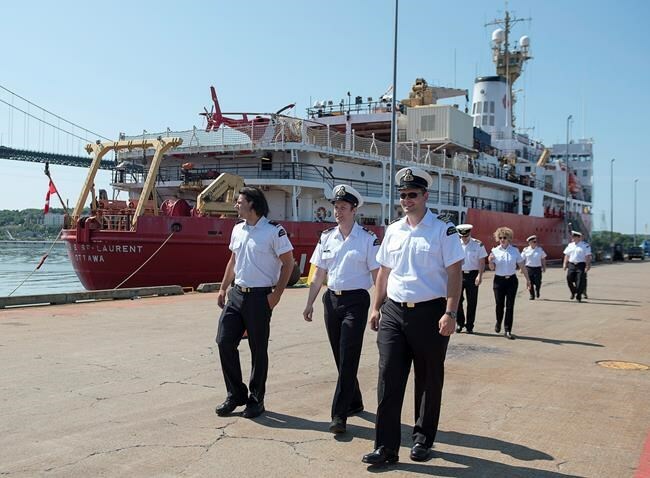 The Canadian Coast Guard Ship Louis S. St-Laurent is scheduled to leave Halifax harbour on Friday, carrying a team of international — and somewhat excited — scientists and high-tech gear for mapping the ocean floor. The data collected will be used to define the outer limits of Canada's continental shelf in the Arctic Ocean. Once the data is analyzed, a submission is expected to be presented to the Commission on the Limits of the Continental Shelf in 2018. "This work cannot be overstated — it is fundamental to an exercise in Canadian sovereignty and to establish Canada's last maritime boundary line," federal Fisheries Minister Dominic LeBlanc said Thursday as he stood on a sun-drenched jetty beside the hulking ship. "This is especially important in the Arctic region, which is facing unprecedented change from both an economic and an ecological perspective." For some of the scientists on board, the trek to the pole will provide an rare opportunity to see things that have never been seen before. "The Arctic Ocean is the smallest ocean in the world but the least studied," said Mary-Lynn Dickson, a director at the Geological Survey of Canada. "From a geological perspective, any data that we collect when we're out on the ship is all new data. It's all new knowledge that people have never seen before. So the excitement for me and our team .... when we roll out the big maps and we're looking at it — the excitement is palpable." Once at the top of the world, Dickson said she plans to get off the ship — if the ice is stable — and walk around the pole, a stroll that will effectively take her around the world and through every time zone. When the ship made a similar voyage last year, researchers discovered five underwater volcanoes along the way, said Paola Travaglini of the Canadian Hydrographic Service. The United Nations Convention on the Law of the Sea allows all coastal nations to extend their jurisdiction beyond 200 nautical miles as long as it can prove the boundary is a natural extension. No less than eight countries surround the North Pole. It is the subject of competing claims, which reflect the area's growing importance in terms of shipping lanes and potential resource extraction. "We believe Canada has a very, very strong case that we're prepared to make under the United Nations Law of the Sea," LeBlanc said. "It has to be based on something more than political bluster. It's got to be based on science and international law. Those two concepts come together beautifully in this mission." When Stephen Harper was prime minister, his Conservative government made Arctic sovereignty a top priority — and Harper made regular visits to the High Arctic. Russia, the United States, Canada, Denmark and Norway are working with the UN to define boundaries in the Arctic, which is thought to hold as much as a quarter of the planet's undiscovered oil and gas. Last August, Russia issued a revised submission for its claim to 1.2 million square kilometres of the Arctic shelf. LeBlanc suggested he wasn't concerned by how the Russians might react to the Canadian expedition. "This is not a belligerent posture," he said. "This is a scientific expedition with international partners ... This is not about international politics." The first leg of the trip will see the ship heading to Norway as part of a transatlantic seabed mapping expedition. The second leg includes the 47-day mission to the North Pole, which will include help from the Swedish Polar Research Secretariat and the Geological Survey of Denmark.